A trip to Lanikai Beach is a must-do when going to Hawaii, especially if you and your loved ones plan to stay on Oahu. However, there are some things you should probably know about this beautiful beach before you go. There’s a reason why this beach isn’t as popular as other beaches in the Hawaiian isles. Lanikai in Hawaiian translates to “heavenly beach.” And it’s adequately named. That’s probably why it’s one of the most photographed places in Hawaii. Many tourists pick this little piece of heaven as their go-to beach in Hawaii because it’s usually quiet and uncrowded. By car. Tourists who would like to drive to Lanikai Beach can take the HI-61 N from Honolulu through Kailua to Lanikai. Two other routes are to take either the HI-63 N or the I-H-3 E. The first option will get you there in 30 minutes while the latter two will take approximately 37 minutes in no-traffic conditions. By public transport. Though this way will take more time, it will save a lot of problems with where to leave the car (see things to know about Lanikai below). There are two ways of getting there by bus: from Honolulu take bus 57 from Alakea Street and get off at S King Street, a bus ride costs $2.50; after getting off the bus in Kailua, tourists can either take a 30 minute walk to the beach, or wait for bus 70 to take them directly to the beach. By bike. Unfortunately, bikes aren’t allowed on the HI-61 N, the HI-63 N, nor the I-H-3 E. Those who would like the exercise could take the 8-mile ride down the HI-72. Although they will probably need to stop several times along the way, it’s well worth the effort in order to see the breathtaking scenery. Still, we recommend tourists leave early for this one since it will take approximately 2 and a half hours to get there. Now that we’ve gotten the logistics about going there out of the way, it’s time to look at the things to know once you do get to the actual beach. It’s a residential area. 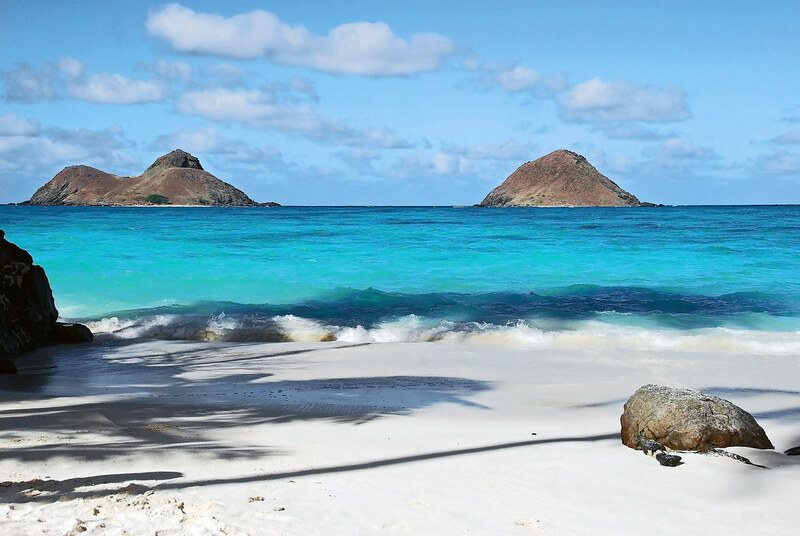 Unlike most other Hawaiian dream beaches, Lanikai is situated in a community area. Tips: be respectful to the people, don’t blast music too loud, and pick up your stuff before you leave. You won’t have parking. Okay, there are a few parking areas for tourists, but not that many. Most of the Lanikai beach parking areas are reserved for locals. Be respectful and don’t take up their space. You can find a parking lot further down the road specifically designed for tourists. The fine for parking illegally is $200. We still suggest taking the bus. There are no restrooms. Because this is a residential area and not a state beach, there are no restrooms, showers, or fountains. Some locals have tried to improve the situation by mounting some faucets along the beach access ways. There are no handicap facilities. There are no handicap designated parking spots near Lanikai Beach. The Kailua Chamber of Commerce advises people who require handicap parking to choose Kailua Beach instead. It’s super remote. Lanikai Beach is nothing like the crowded Waikiki beaches. Because it’s so far from the city center, few tourists actually come here, especially on weekdays. Think of this beach as a quiet retreat on Hawaii’s Oahu Island. It’s a good place to practice surfing. Many recommend this beach as being perfect for those who want to learn to surf or teach their young ones how to surf. Lanikai Beach rentals even has all the equipment you need. It’s perfect for snorkeling and scuba diving. This beach features some of the bluest water on earth. It’s super clear and thus provides a perfect underwater environment for snorkeling or scuba diving. It’s very photogenic. When the weather’s good this beach may be the one where you can take the best photos in all Hawaii. If you happen to be around when the full moon rises, a fish eye lens could do miracles! It’s a good place for a barbecue. Locals do it all the time. Gather on the beach and party until the sun rises. Just imagine trying to barbecue on a crowded beach like Waikiki. No, thank you! But here? It’s perfect. It’s great for kayaking. Some even say that it’s a good idea to rent a kayak at Kailua Beach and simply sail on over to Lanikai Beach. We should add this one to the list of how to get to the beach because it’s a brilliant idea. Are you at all excited about going to Hawaii? If so, then you should be even more excited to stop by the serene retreat that is Lanikai Beach. We hope we’ve given you enough reason to! Have you already been to Lanikai? Let us know what you liked the best so others can follow your lead.